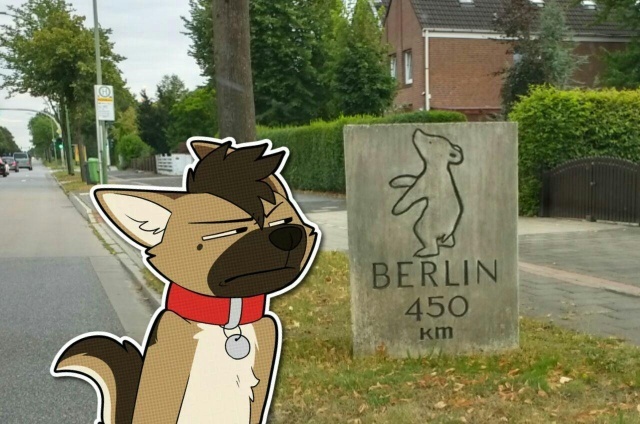 Eurofurence is about half a year away, and therefore now is the best time to sort out your travel essentials, so here's our first Spectacular Travel Update[tm]! Now's a good time to prepare a few things, especially if you've never been on a longer trip before. - Generally make a rough draft outline of your trip, including (coarse) times and dates of your flight, road trip, dinghy raft, whatever. As every year, this is the time where I will tell you again that visitors from outside Schengen countries need both a valid government ID and may need a travel visa. If you choose to ignore that advice, you will be entirely responsible by yourself for the hilarity that ensues. You will find further information on the web site of the German Foreign Office and can find out there whether you need a visa for the Schengen area. Waiting time for German embassies and consulates may be significant, especially in lesser developed countries. Also, some countries are notorious for taking a long time to process passport applications, especially for first-time issues. Remember to sort out your health insurance well in advance too - visitors from the EU should get a EHIC card from their national insurer, others should get private travel insurance to be on the safe side. A trip to the hospital, for whatever reason, can easily cost you thousands when not insured. Visitors from the United Kingdom: At this point it's really too early to say how your travel may be affected. One good advice is to check the expiration date on your passport right now, and ensure it is valid for at least six months after your Eurofurence trip (that's March 2020). If your passport is to expire soon, now is probably a better time to renew it than later in the year. Good news! Construction on the A100 has progressed so far that the diversion of Grenzallee has been removed some weeks ago. There may be some local obstacles, but concerning reachability by car the hotel is now basically back to pre-2016 levels. Remember that the low-emission zone starts just around the corner from the hotel though, so if you feel like driving anywhere within the central districts of Berlin (i.e. you are totally crazy and in dire need of professional help) you will need the appropriate sticker for your vehicle. Last year's discount ticket offer will return, although the internal handling will be slightly different this year, so there's no booking link yet. Note that at this early stage the site will also offer you other DB fares that - depending on your route and the distance you're travelling to Berlin - might be slightly cheaper than the Event ticket - however, there is a certain threshold that must be sold for a specific event so if you want to help Eurofurence out, book the ticket even if it is slightly more expensive than the other options. Thank you! Alas, the price will remain stable right up until EF, as the contigency allocation works different from other fares. If you plan to make your travel arrangements shortly before the convention, this is a good thing to remember. When travelling from Schönefeld Airport please note that there are track works on line S9 between Baumschulenweg and Treptower Park for the first half of August. A rail replacement bus service will be operating there and journey times may be significantly longer. Your alternatives are regional trains to Ostkreuz or city bus No. 171 which goes from SXF airport to Sonnenallee station. All these changes should be timetabled in the DB and BVG journey planners. In case you don't remember from last year, our "official" overflow hotel is the andel's by Vienna House Berlin. However, there is no 'exclusive' Eurofurence rate this year (mainly due to extremely slow communications on their part), so feel free to use the booking portal of your choice. Next to the Estrel Hotel, there's the Berlin S-Bahn station Sonnenallee. From there you can catch a train that takes 12 minutes to Landsberger Allee. Trains are running all day except at weeknights between 1:20 and 4:20 (on weekends, the S-Bahn runs 24 hours). The S-Bahn fare is €30 for a 7-day ticket. The shuttle bus will be free to use, but operate only when the trains do not run. There also is a hostel nearby Landsberger Allee, the Generator Hostel at Storkower Straße, approximately 150 metres away on foot. Find further details (and pretty pictures) at https://www.eurofurence.org/EF25/hotel/overflow - it's all written on the web site. Good to know: If you are booking an external hotel stay but you are still on the lookout for an Estrel room (for example if you are on the waiting list) consider booking a flexible rate that can be cancelled. This will help smoothen things in case you really should rebook yourself into the main hotel. Also, lastly, a word of caution about airBnB. Be aware that airBnB is tightly regulated in Berlin, and the Berlin senate is actively shutting down illegally run hostels. We've had a few cases where EF attendees were put in an uncomfortable situation because of their booked accomodation suddenly disappearing without warning. Even if you are on a tight budget, always make sure to check twice. As tempting as those "sharing economy" services may be, they are of little help if they end up ruining your holiday. Pick a proper, licensed hostel or hotel, for your own peace of mind. That's all for now! If you have any questions feel free to use our forums, the contact form on our web site (nobody ever reads the web site) or ask in any of the not-so-official Telegram groups.